Goodness! What’s got into me, more than one post in a week! This was a lovely rubber stamp that I vaguely remember being stamped onto the back of the hand of visitors to the 12th exhibition. 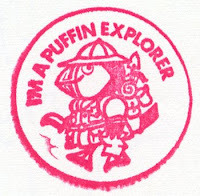 I asked nicely if I could have one stamped into my Puffin Thinkbook – and I got it! This was one of a whole set of Jill McDonald designs that appeared on button badges that were also doled out – yes, you guessed it, I’m going to post these as well.